I watched A GOOD DAY TO DIE HARD (2013) on 1.12.13. It was my firs viewing of the film. This isn’t a terrible movie. Worse, perhaps, it is an unnecessary movie. It would be better if this fifth DIE HARD went out in a blaze of glory doing something crazy, or daring to make a film which sticks disgustingly close to the original, but with Bruce Willis’ officer John McClane as an old man alone in a building. 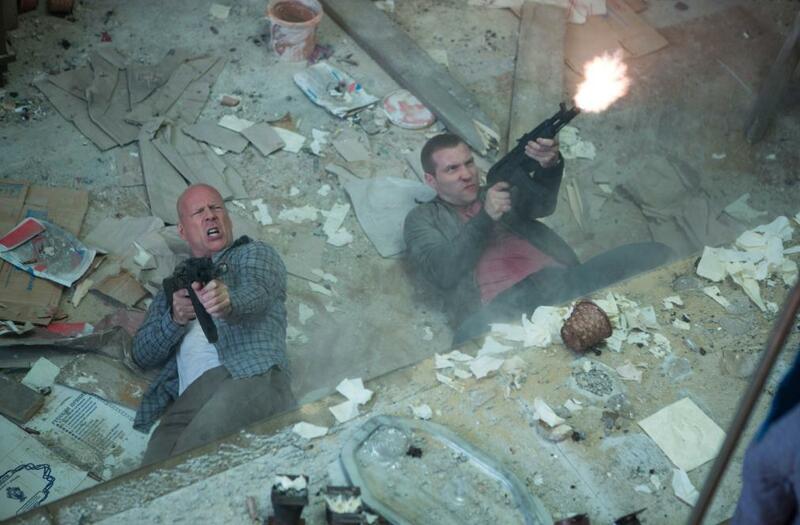 Instead, McClane is in Russia with his spy son Jack (Jai Courtney) running around and blowing things up in a generic manner. The characters care about some file, but we don’t, and the movie doesn’t either. That would be fine if a clever twist didn’t makes it all irrelevant anyway. Nobody cares about anything having to do with this movie. The filmmakers don’t. The actors don’t. The audience doesn’t. So, for a single viewing, A GOOD DAY TO DIE HARD is inoffensive. It has a car chase, it has shooting, it has a couple of laughs (though not nearly enough). It lacks grit. Ironically, while the fourth film was panned for being PG-13, this movie may be the one with the smallest balls in the entire series. This is DIE HARD for the artificially enhanced age. Nothing feels legitimate, though no single moment is as bad as the jumping-off-the-jet bit from the fourth movie. The visuals, likewise, are bland. Color tinting has rendered much of the world in harsh blues, greens, or grays. There is no light in the world. It’s all, again, artificial. The car chase looks good, some of the action bits look good, and a jumping out of a building scene, surprisingly, looks good. Not much else does. McClane has become less self-deprecating and more cranky old man. He rags on his son even after learning that all the assumptions the father made about the son were dead wrong. He’s less likable here, because his humor comes at the expense of Jack rather than himself or the bad guys. Despite all of that, I’d still see a sixth movie because, like Indiana Jones, there will come a point where there won’t be anymore. Plus, we can always hold out hope that a sixth one would actually get the tone right. ~ by johnlink00 on January 13, 2014. Nice review! I loved the first Die Hard, but some of these sequels just seem…sad. Lol. Are any of them worth watching aside from the first? The second for sure, and the third if only for the Samuel L Jackson/Bruce pairing (oh. And Scar playing the villain). The 4th and 5th? Not so much. The first Die Hard is great. The second is fine. The third .. I quit the series after the third. Your review, despite your tepid praise, doesn’t make me regret that. Sounds like I’d hate this. Yeah. I wouldn’t blame you if you did. There is literally nothing noteworthy or memorable. Wasn’t really a Die Hard movie. Instead, it was more of just an action flick that just so happened to star Bruce Willis as some old, crotchety dude who couldn’t stop telling everybody he’s “supposed to be on vacation”. Good review John. I felt the same way about the fourth. See, I didn’t mind that one as much. Especially now, considering I’ve seen this piece of junk and realized that it’s the furthest thing from being a “Die Hard” movie. It was the jumping off the jet bit that lost me in number four. I started referring to ‘jump the shark’ moments in movies as ‘this movie just jumped off a jet’. At least until Indy ‘nuked the fridge’. Because that was ten times worse.